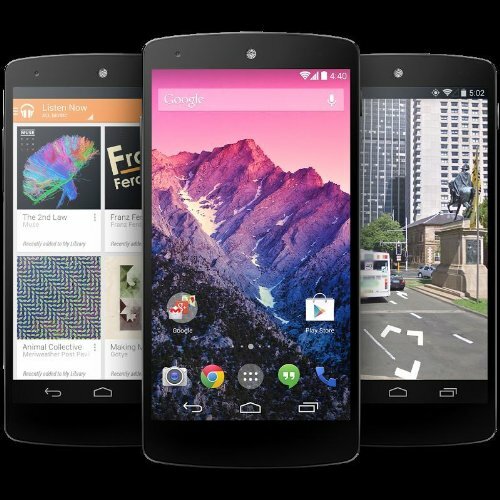 Google Nexus 5 is a fascinating cellphone launched in 2013, packed with a 5-inches multi touch screen, a high performance Quad-Core CPU clocking at 2.26 GHz, an 8 mega-pixels back facing camera and a 1.3 megapixels front-facing camera. This phone is sold in 3 different color options, black, red and white. This phone is just 0.34 inches thick, taking it to the thinnest phone's category. 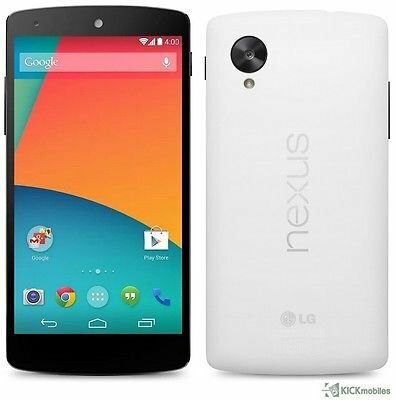 Whereas the Google Nexus 5 is only 5.43 inches long, it's still able to fit a a 5" screen. This cellphone feels much lighter than what you would expect from a phone this size. Google ships this phone with a Qualcomm Snapdragon 800 MSM8974 chip, which holds an extremely powerful Quad-Core CPU speeding at 2260 megahertz with a big 2 GB of RAM. Handling graphic rendering, this cellphone also uses an Adreno 330 graphics processing unit ticking at 450 MHz. A good advantage of the Google Nexus 5 is its quite big 16 GB internal storage memory and while it doesn't count with an SD extension slot, it is enough to store a couple hundred apps, although it might not be suitable if you are planning to install a couple of the largest games currently available or taking tons of photos and videos. This cellphone has an absolutely amazing 5-inches screen with a 1920 x 1080 (Full HD) resolution, which makes all images and videos look amazing. Its screen uses IPS LCD capacitive technology, and can detect multi touch gestures. This cellphone is equipped with two cameras, an 8 MP back side camera and a 1.3 megapixels front side camera. It can also capture videos in Full HD 1920x1080 at 30 fps. This phone also counts with a large number of useful characteristics like auto-focus, flash, optical image stabilization, fast burst mode, face detection shooting, geo tagging and HDR mode. This phone uses a 2300 mAh huge Li-Polymer non-replaceable battery that can keep it running for several hours, although you may need to charge it if you use it too much. This cellphone has a reported stand by time of 300 hours and a talk time of 17 hs. An issue to consider is that this device's battery is not removable	so you can't buy a new battery when it starts to last shorter, even though with its 2300 mAh you will probably discard this phone before it becomes an issue. The Google Nexus 5 offers WiFi connectivity (and it can share it with other devices acting as a modem), 4G LTE fast connectivity and also HSPA+ internet connection, which is a slower 4G variation or the fastest 3G connectivity, supported by HSDPA, HSUPA, UMTS and EDGE technologies. 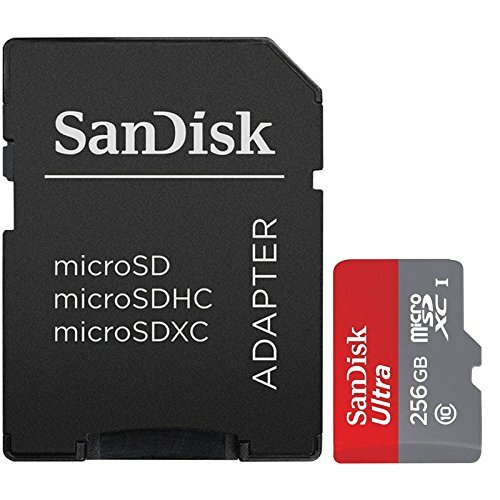 This phone works with a Micro SIM card to connect to GSM networks and it works with both CDMA and GSM. This phone also comes with some interesting features like Bluetooth (4.0), GPS Navigation and NFC (to trigger actions, transfer data or make payments by holding your phone close to another NFC device or tag), and multiple sensors like Light Sensor, Proximity Sensor, Accelerometer, Gyroscope, Barometer and Compass. 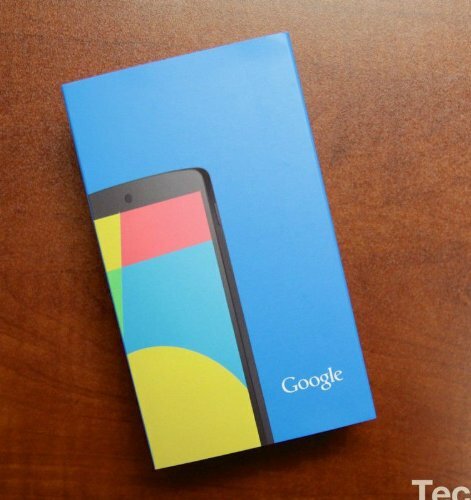 Google sells this phone for only 305 dollars, which is a real bargain comparing with similar cellphones. No matter if you will use it to play games, will use it as a work phone, will use it as a social device or want it to take tons of pictures, this cellphone is the correct option for you.